The Invasion is the fourth movie adaptation of the classic 1955 sci-fi novel The Body Snatchers, in which an alien species invade the earth attempting to infect all of human kind with a virus that turns people into stone cold humanoids devoid of emotions. 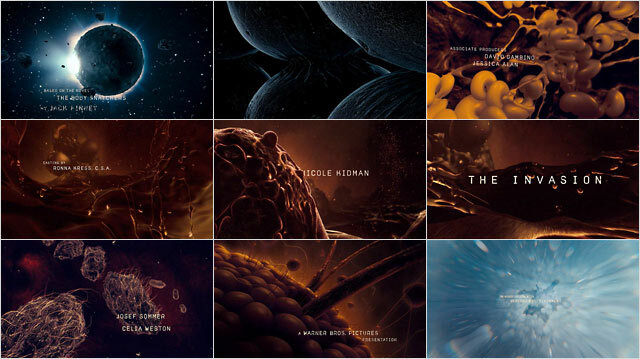 The end credit sequence by Danny Yount, creative director at Prologue, visually relates planetary bodies in outer space to the macro world of cells, blobs of blood plasma and floating particles inside the human vascular system – a world that we've only recently become aware of by way of the electron microscope, but remains quite alien to us nonetheless. The title sequence evokes memories of the 1966 sci fi movie Fantastic Voyage. As a self-taught designer, Danny Yount learned everything he knows the hard way. It was the work of Kyle Cooper that lead him in the direction of main title design. "It wasn't until I heard about what Kyle Cooper was doing with Imaginary Forces that I was able to get a clear sense of what I wanted to do," Danny told Desktop in an interview, "From that point on I made it my goal to design main titles. To me it was like gravity – it seemed to be the most logical thing to do. I spent a year building a reel and refining my skills."